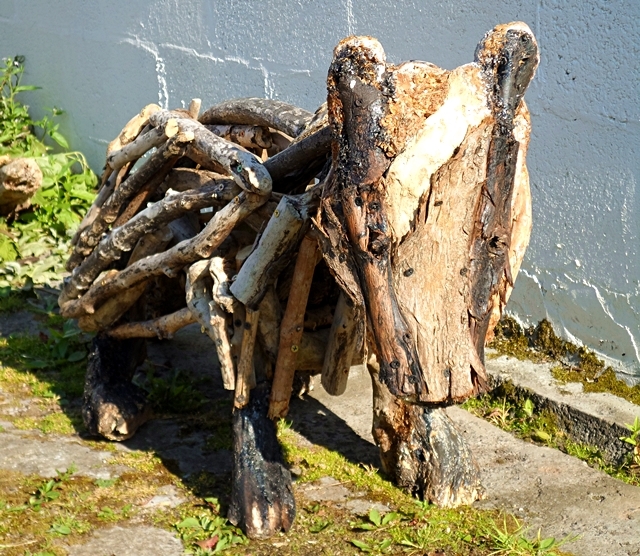 Since completing the squirrel, I have been busy creating a badger and a deer for the Eco Arts Garden Project. The badger proved quite challenging with his big feet and instantly recognisable features. I used some old burnt wood to get some contrast on his face but took quite some time finding suitably gnarled pieces to form his legs and feet. I think this project fell somewhere between the driftwood sculptures and the use of shavings and wood glue, as with the tawny owl. 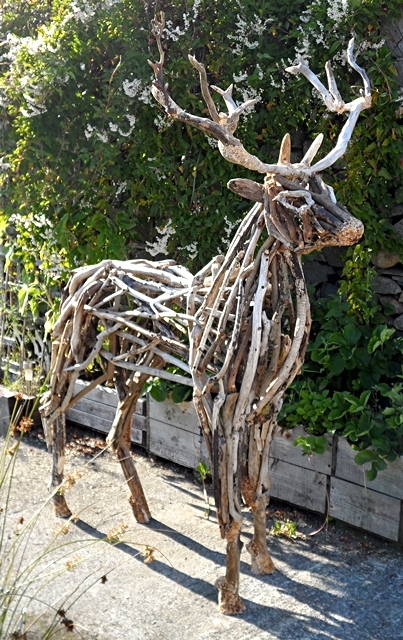 I was keen to get back to a larger scale project and chose a red deer stag as my next project. 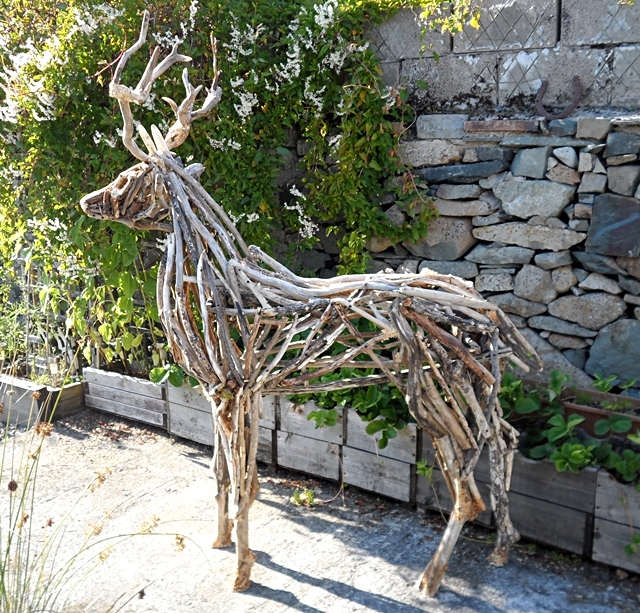 The amazing thing about this project is that people seemed to recognise it as a deer almost immediately! I was a little worried that it would look a bit like a horse with horns to start with but it developed very well and may even be the most successful sculpture to date. There was a minor problem finding and transporting the antlers safely, which I then proceeded to break by foolishly leaving the deer on three legs for a moment! After a hasty bit of repair work, all was well. Considering it is just a little over three months since I started the driftwood horse, I have to be quite pleased with how it is going. The sculptures have certainly attracted plenty of interest locally and the Eco Arts Garden Project is already planning to expand. I will bring you up-to-date with my next project very soon. 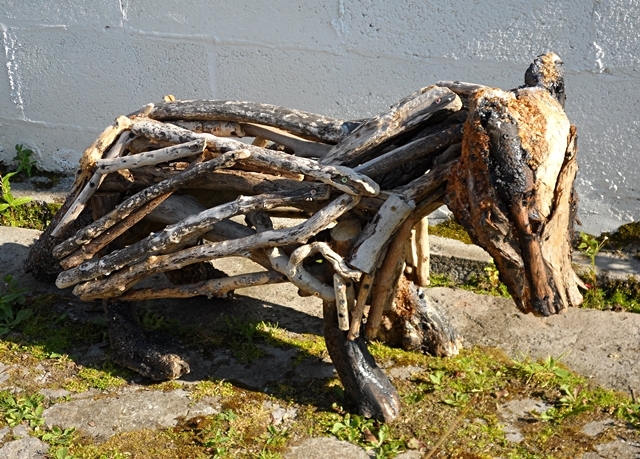 This entry was posted in Crafts, Recycled, Sculptures, Wood and tagged Animal sculptures, badger, deer sculpture, driftwood, driftwood animals, wood sculptures. Bookmark the permalink.